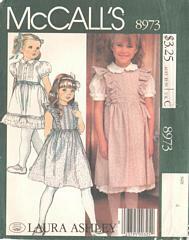 Girls' pullover jumper, with buttoned back opening, has tucked bodice front, ruffles, gathered skirt and side ties. Pullover blouse has buttoned front opening, front tucks, collar with ruffle and short, puffed sleeves with ruffles and cuffs. Petticoat or skirt has elastic in waistline casing, beading and ribbon trim and ruffle of self-fabric and eyelet. Purchased ribbon sash. Size 4; Breast 23; Waist 21; Hip 24. Pattern is uncut and complete and in original folds.